Being the sweet tooth that I am, I love desserts, I can pig out in a buffet and have enough room in my stomach (or heart, since desserts goes directly to your heart) to chow down on every sweet on the menu. 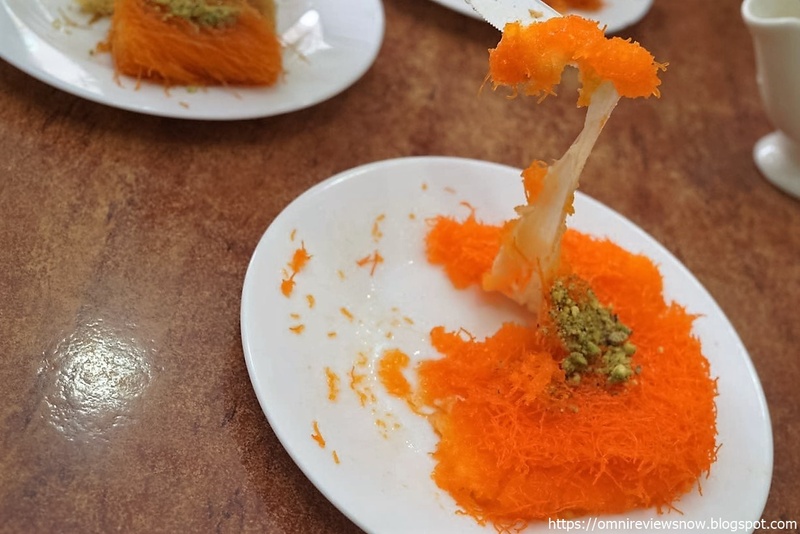 That is why when I came here in the United Arab Emirates the first thing I looked for other than the scenery are the local cuisines and what do people have here for dessert. Do you love cheese? noodles? 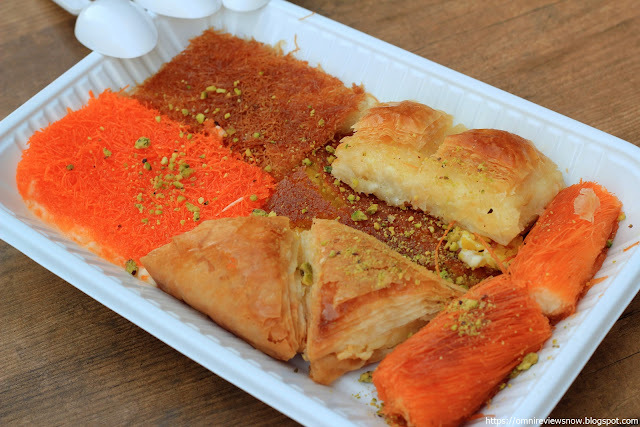 or how about sweets? We'll if you love all of those then there's a dessert here in the middle east that you have been missing, it's called Kunafa and it's a perfect mashup of sweet, salty, crunchy, and chewy all at the same bite. Read more after the break. 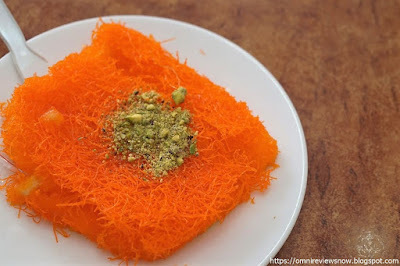 What's a Kunafa? 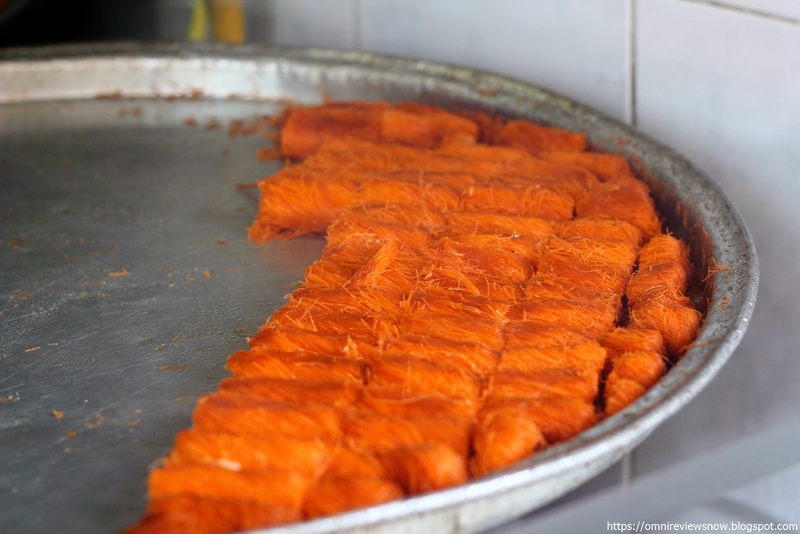 According to Wikipedia it's is a Palestinian cheese pastry soaked in sweet, sugar-based syrup, can be spelled kunafeh or kanafeh, and has several variants, but in this review, I’ll be focusing on the one I usually get when we go out for dessert. 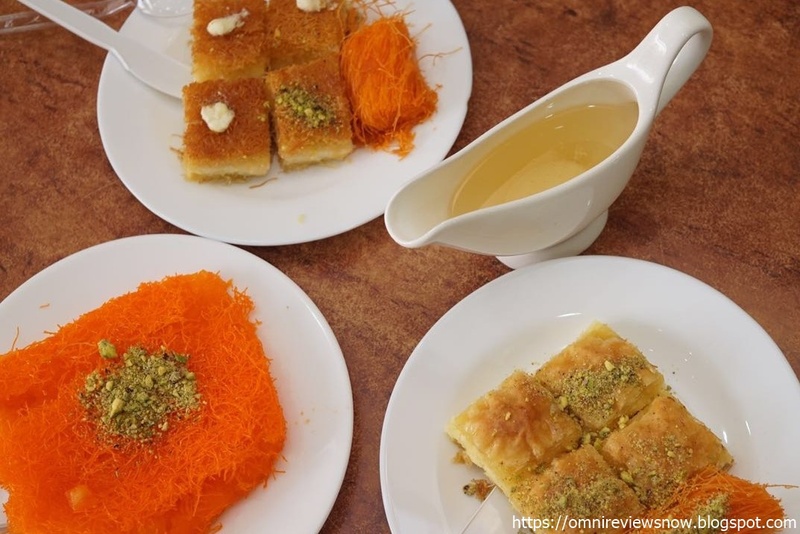 First time I ordered, not knowing which is which or what’s good or not, I asked for a sampler and costs me around 30 dirhams, tasted each one and originally the piece that stood out was the croissant like bread with cheese but over time the sweet crunchy noodle pizza-like became the favorite choice. Most kunafa variants differ on looks alone and very little on taste, the flat orange colored I believe is the most common one and then the rest follow suit, all three below are cheese based kunafa. One other variant is made not with cheese but cream which makes it lighter and preferred by some for a more dessert feel rather than a snack. 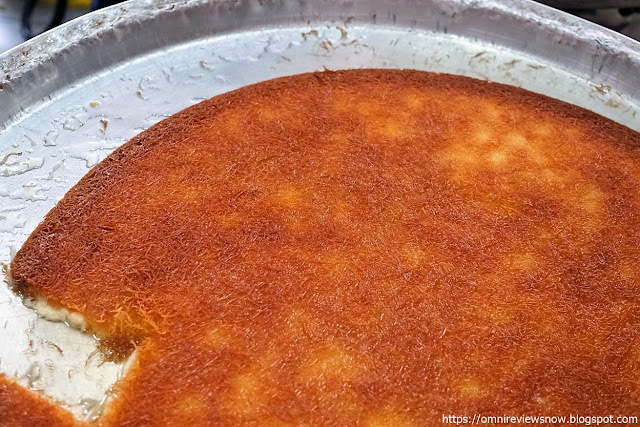 Cream based kunafa are usually found in the menu of restaurants that serves Madni and are cooked individually on small burners as you order. Depends on how much you order, you get a complimentary piece sometimes. You can ask for the sugar based syrup or a chocolate one for an extra charge. 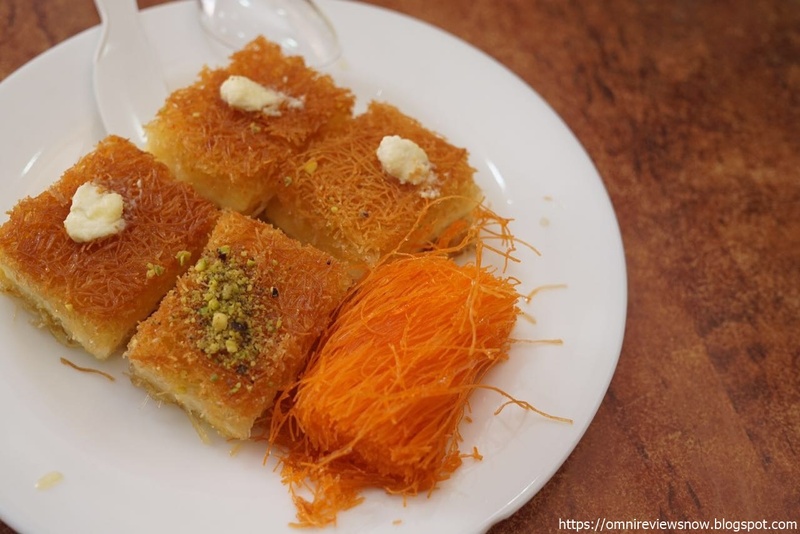 I've had kunafa on several places but what I would highly recommend for you to try if you get the chance is from a called Feras (Firas) Sweets, the food are always served hot by the friendly staff that wouldn't mind you giving you a bit more than you ordered. The price is a little steep if you are frugal like me but a 10 dirham worth of slice would be more than enough for most people. 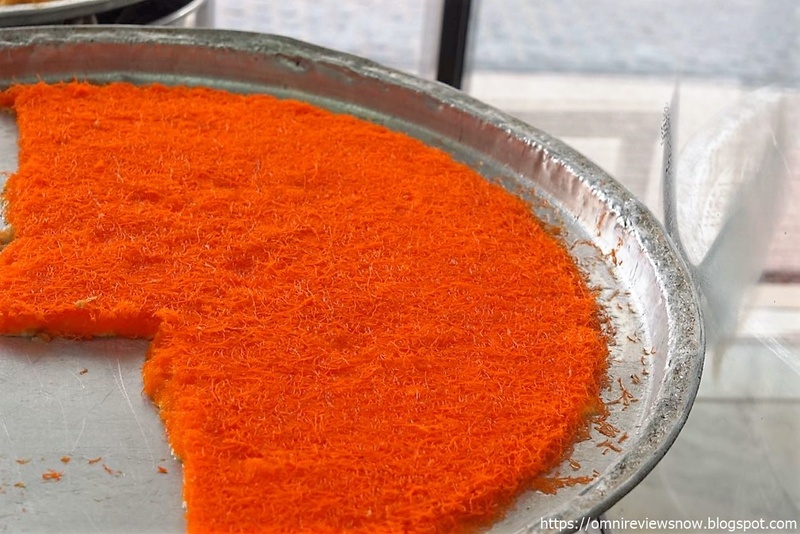 Kunafa is one of the more unique dishes you'll have in your life. On paper, noodle, cheese, and sugar doesn't seem right but when executed correctly this is what comes out. A definite must try and I can assure you'll always go back for more.